Cost of SEO services, along with pricing structure, types of services, and service providers, are factors for businesses to consider before partnering with an SEO firm. Gathering information and making decisions boil down to a single action: Google search. As a result of buyer impulse to refer to search engines to make buying decisions, businesses have been investing more in Search Engine Optimization (SEO) to appear among the top results for target search terms. Our surveys of 500 enterprises and 305 small businesses found that 47% of enterprises and 52% of small businesses invest in SEO. But, finding an SEO firm that offers the services you need and fits your budget is difficult, according to interviews with 150 clients of SEO and digital marketing agencies listed on Clutch. Nearly 1 in 5 (19%) said they had a negative experience with an SEO firm before finding the right SEO service provider. Using insight from thousands of reviews of SEO firms on Clutch, we help you choose the SEO services, and the type of provider best suited for your company, based on your SEO needs (onsite, offsite, and/or digital marketing) and budgetary restraints. The cost of SEO services depends on the complexity of a campaign: the number of pages on a site, existing SEO efforts, and site structure. Dan Golden, President of Be Found Online, a Chicago-based SEO firm, says his firm determines the price of SEO services according to project complexity factors. Determine whether basic, agency, or enterprise level SEO services are best for your organization by using our monthly cost breakdowns and case studies. Basic SEO services are a low-cost, low-risk investment for smaller businesses and local contractors, companies with a new website, or companies with fewer SEO services demands. Services provided in this price range include local organic optimization techniques, such as listings on local directory pages and on Google Local Business. A fencing company ranked for 7 out of 17 target keywords in 2013. They worked with Boostability and now rank on page 1 for all 17 keywords. 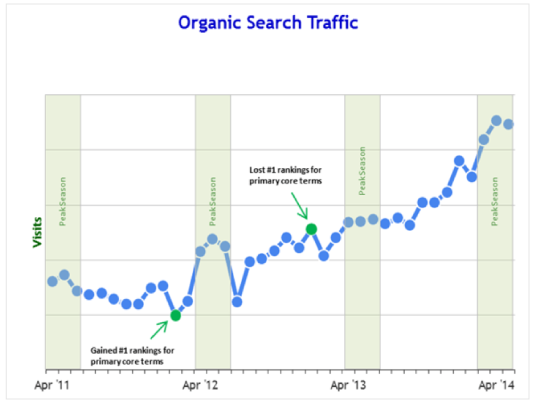 Boostability launched 800+ SEO tactics focused on keyword optimization. They also provided content marketing, link-building, and monitoring services. Approximate Monthly Cost : $1,000-$3,000 for competitive local SEO; $3,000-$10,000 for competitive local and national SEO. Agency level SEO services are best for organizations that want to rank in search engines both locally and nationally. The cost of SEO services at this level breaks down into two main ranges according to keyword competition, market size, and website size. A small, e-commerce site that specializes in online battery sales struggled with rankings for its two target terms. Pole Position Marketing removed no-follow links from all of the sites product pages, not just those relating to the top two target terms. As a result, product pages receiving organic traffic increased greatly. Correspondingly, revenue grew 92% over a three year period. A small fashion retailer moved to a new domain with existing negative SEO. Coalition Technologies launched an SEO campaign which included on-site and off-site services to gain rankings for the retailer’s new domain. Agency level SEO services at the $3,000-$10,000 range benefit small and medium sized businesses with high-volume websites that operate in competitive and large markets or want to rank for searches nationally. Social Vantage, a social media marketing company, faced an incredibly competitive landscape for target industry terms and keywords (i.e. “social media marketing”, “social media management”). Searchbloom instituted an on-site focused optimization campaign and moved the site into competitive positions for approximately a dozen key terms. As a result, the first half of 2017 saw a YoY increase of 224% in completed leads. A law firm, operating in a highly competitive local space, only ranked for long-tail keywords. Thrive Internet Marketing optimized and created site content, supported by link-building efforts, to move the firm into top 5 rankings for hundreds of target terms. A dental practice, operating a highly competitive local space, did not rank for target local terms. Fruition performed on-page optimization to earn local rankings and subsequent traffic and conversion increases. Enterprise level SEO services serve large companies, large e-commerce sites, and companies competing for hypercompetitive keywords. Firms that require enterprise level SEO services often have websites with tens, if not hundreds, of thousands of pages that require regular, high-level SEO services. A national rehabilitation clinic had no website or domain, and operated in a competitive national market against household names. Sachs Marketing Group built out, and optimized, the clinic’s website. The site now ranks on page one for 150+ terms and experienced notable expansion as a result of the leads brought in from search engine traffic. An online golf retailer only ranked for brand search terms, or keywords with their actual company name in them. Be Found Online instituted site architecture changes and optimized high-performing landing pages to move the golf retailer to competitive positions for national search terms. A startup precious metal collection firm needed immediate, and effective, returns from search engines to compete in their highly competitive industry space. SEO Advantage used a content services-led SEO campaign to earn page-one rankings for over industry 40,000 industry terms. Cost: $5,000 per domain with an average rate of $10,000/mo. Negative past experiences with an SEO firm made a B2B furniture retailer doubt the value of SEO. Vizion Interactive enacted an encompassing SEO campaign that increased organic traffic for the furniture retailer over 700% over 11 years. A commercial equipment retailer suffered tremendously from being placed under a Google penalty due to shady back-links to their site. Bruce Clay performed a Google penalty assessment, nullified the effects of the penalty, and instituted link maintenance services to move the company back into positions of search relevancy. A construction management software company was not generating returns from previous SEO & PPC work with smaller providers. Directive Consulting optimized high-performing pages as a basis to build authority for the site, which coupled with on-site technical SEO work, improved site traffic and drove qualified leads to the site. A sizeable health and fitness news site sought assistance for maximizing the SEO impact of their content. 97th Floor applied a proprietary term frequency optimization method to increase traffic of target articles. Most SEO firms charge clients monthly (a monthly retainer) according to project size and contract length. SEO firms also require minimum terms for SEO campaigns: The industry standard is six months. Other pricing models for SEO services include performance-based and service-based models – often in addition to an established monthly retainer. Performance-based pricing for SEO services is based on project results: key performance indicators (KPIs) like keywords rankings, traffic or leads. Performance-based pricing is relatively low-risk since SEO firms only charge you if your campaign hits the agreed KPIs. However, you may face higher rates for SEO efforts that exceed established benchmarks. Service packages charge a fixed rate for one-time or short-term SEO services, such as an audit or social media marketing. Individual service packages resemble a traditional transaction (payment for an immediate deliverable) but are unlikely to yield ongoing results like SEO efforts covered under monthly retainer fees. Full-service packages include all of a firm’s SEO offerings at a fixed rate. SEO Agencies handle all aspects of an SEO campaign for a company: initial research and audit, strategy formulation, campaign execution, project maintenance, and data analysis. Agencies specialize in SEO services and have advanced SEO tools and software at their disposal. Companies with limited knowledge of SEO or limited resources to maintain an SEO campaign benefit from the hands-on, leading role of SEO agencies. 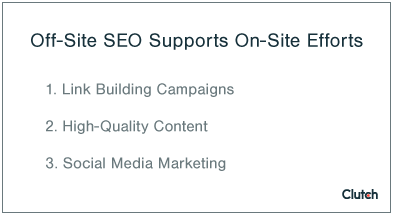 SEO Consultants play a supporting role. Consultants are SEO experts that specialize in SEO services. However, they are “more mentors than doers,” according to Bruce Clay, who runs the consultancy, Bruce Clay Inc., and is one of the most recognizable SEO consultants in the field. Consultants work with their clients to develop an SEO strategy, show them how to execute strategy, and teach them to maintain SEO efforts over time. For companies that are unsure about hiring an SEO agency or consultant, SEO software is a do-it-yourself option. 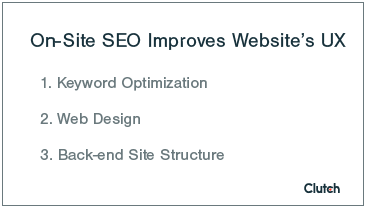 SEO software automates optimization efforts, such as link auditing and keyword research. Popular examples of software are Moz and Ahrefs. Both offer tools that provide information on target keywords and link profiles to help companies create an SEO strategy. SEO services are not exclusively provided by firms with specialized SEO knowledge. Digital marketing agencies offer services that impact SEO, including content marketing, social media marketing, and paid advertising. The SEO services that are valuable for your company depend on your SEO needs and the competition in your industry. “It's very important to properly qualify the client to solve their pain points and then recommended SEO as a channel that may help accomplish the clients' goal(s),” said Mike Salvaggio, CEO of Philadelphia-based SEO firm SEO Brand. SEO firms offer services in five buckets: an SEO audit, on-site optimization, off-site optimization, digital marketing, and reporting and analytics. Understanding what services you need will help you determine the best SEO provider: an agency, consultant, software, or digital marketing agency. The audit determines whether you should invest in on-site, off-site, or digital marketing SEO services. On-site optimization makes your site easier for search engines to index by improving your site’s UX and ensuring proper categorization. The main on-site optimization effort is keyword optimization, which ensures target keyword phrases are included, where relevant, in the content of your site – namely site copy (including blogs, landing pages, and navigation functions) and alt text labels (images, internal links). Second, optimizing your website’s design helps search engines process content on your site. SEO firms optimize design elements like your domain name (ensuring your domain name matches your service offerings) and site format (site menu, landing pages) to emphasize target search terms and topics. Finally, optimizing the back-end structure of your site includes editing URL structure, attributing images using target keywords (alt image attributions), adding title tags, and including meta descriptions for relevant pages. Offsite optimization efforts support on-site optimization by earning backlinks to your site. Every link to your site from another page serves as an “endorsement” from Google. The more authoritative the page, the greater weight an endorsement carries. Link-building campaigns acquire links from external sources, like industry websites, blogs, and forums, to build authority on a topic. To maintain a strong link profile, link monitoring and disavowal services ensure that “spammy” links, or phony endorsements, are wiped from your profile. In addition, creating quality content and marketing it signals authority and draws links to your site. Content that aligns with user intent and focuses on comprehensiveness and usability resonates with target audiences and draws traffic to your site. High site traffic and low bounce rates signal authority and play a role in search rankings. Off-site SEO serves as the “differentiator,” for Searchbloom, according to Founder Cody Jensen. Searchbloom acquires links for its clients by pitching content to relevant sources and outlets. A model for effective content marketing is Rand Fishkin’s 10X Content. Social media marketing also creates a potential for links back to your site. Experts disagree on the relationship between social media and SEO, but most acknowledge social media engagement increases traffic to your site and exposes your brand to a larger audience. Other forms of off-site optimization include reputation management, influencer marketing, and public relations. Digital marketing services like pay-per-click (PPC) advertising, paid media, and web design improve your site’s visibility in search engines but are distinct from SEO services. An SEO agency or consultant uses on-site and off-site SEO strategies to improve a site’s ranking, while a digital marketing agency looks at SEO in the broader context of a marketing campaign. For example, although PPC and SEO are often grouped together, PPC is a digital marketing service that requires businesses to bid on placement in search results based on target keywords. An SEO firm would optimize on-site and off-site elements to improve the site’s ranking. Wes Reuning, Executive Vice President of Atlanta-based SEO firm SEO Advantage, frames the differences between digital marketing strategies, particularly PPC and organic SEO, as similar to the difference between renting and owning a house. Organic SEO services achieve rankings for the long-term, thus provide ongoing returns. Digital marketing services, on the other hand. provide short-term and instant impact and returns. Analytics reports illustrate the impact of SEO efforts: progress toward the goal of target search term rankings, impact on site traffic, and changes in click-through rates or engagement rates. The depth and frequency of analytics reporting depend on the level of communication between an SEO firm and a company: the more often the communication, the more regular the updates. The level of communication varies by project and service agreement. Typically, the larger the project, meaning the more you pay, the more frequent the communication. This report guides you through the process of choosing an SEO services firm based on cost and SEO service offerings. But, it’s important to examine SEO firms beyond cost to find the best partner for your company. Thorough research during the process of selecting an SEO firm helps to avoid an unsuccessful partnership, a fate suffered by nearly 20% of companies. Start your evaluation process by learning about SEO firms. Seek referrals and read ratings and reviews to gain insight into the type of clients firms work with and the feedback they receive for their work. Reference case studies to see if firms have provided solutions for organizations with similar needs as you. Next, examine the SEO firm's attributes you consider most important. Does the firm share analytics reports with its clients? How often does it communicate with its clients? Clutch’s process for determining the best providers of SEO services takes into account client reviews, past clients, experience, market presence, and service focus. Our content helps people choose the best firm based on cost, geography, size, and service focus. 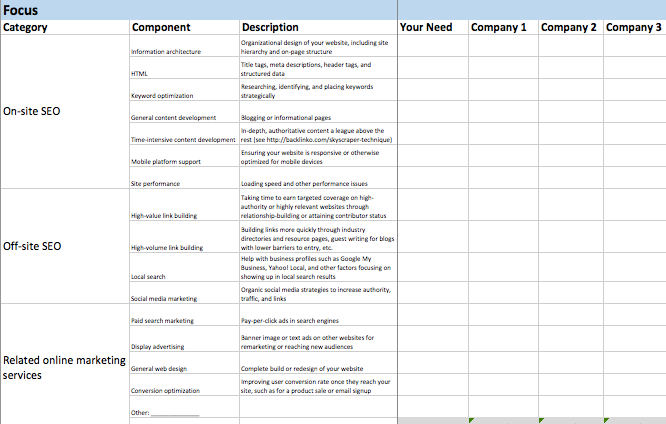 We suggest you use our evaluation tool to help select an SEO firm that's right for you. The tool allows your company to select your needs and the importance your place on a firm's ability to deliver and value. Based on your responses, it recommends SEO firms that fit your desired partner attributes. See Clutch's guide How to Select an SEO Company for a detailed description of the evaluation tool and the information it provides. This guide informs businesses about SEO services and walks them through the process of partnering with a service provider to launch an SEO campaign. The following takeaways summarize crucial cost and service information associated with SEO services that equip businesses with the knowledge to evaluate and approach an SEO partner with confidence. Project complexity and size determine the cost of SEO services. The price of SEO services is determined by the size of the campaign and the challenges your company wants to address, factors that differ by individual firm. Monthly retainers are the most common pricing structure for SEO services. Most firms require a monthly retainer as a baseline price for their services. Some firms also price services according to project type or performance, often in addition to monthly fees. SEO service providers vary in the degree of control over SEO strategy they allow. SEO agencies maintain control over every aspect of your SEO strategy, while consultants provide a more supportive role and SEO software represents a do-it-yourself (DIY) option. SEO services provide value for a business according to its individual needs. The most effective type of SEO service for a company—whether it be on-site, off-site, or digital marketing—depends on their individual SEO "pain points". Evaluate SEO services beyond service offerings and cost. Conduct thorough research into SEO firms before partnering with an SEO service: search for reviews, examine company characteristics, and budget accordingly. If you need help selecting an SEO firm, refer to Clutch’s SEO services page, or contact Tim Clarke ([email protected]) or Ilse Heine ([email protected]).